UPDATE: This Sunshade for dog lovers is currently unavailable. I’ll post a new link when it’s for sale again! By now, everyone should know never to leave a dog in the car even if it doesn’t seem that hot out. You can help spread the word to those who are still uninformed, and maybe help save a dog’s life! 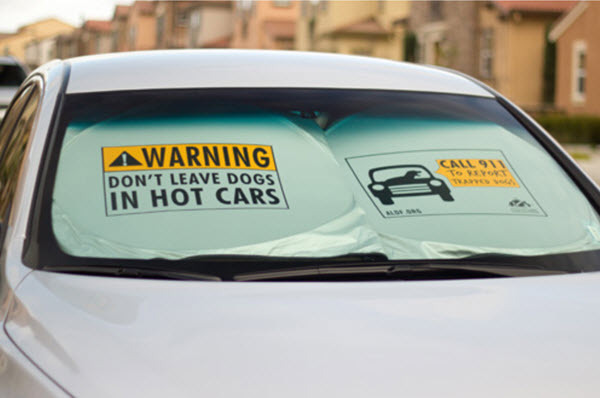 This Hot Car Sunshade from Animal Legal Defense Fund would make a cool Father’s Day gift, and right now when you buy one for $20 you get one FREE! Keep your car cool while making a bold statement. 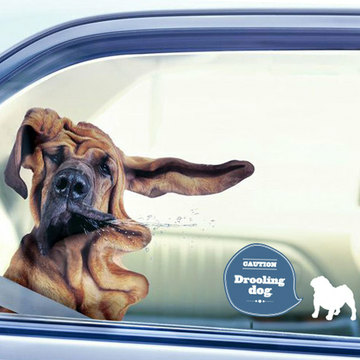 You can protect dogs from the dangers of hot cars by displaying this message wherever you park. The text warns anyone in view that leaving a dog in a hot car can be deadly, and urges anyone who sees a trapped dog to call 911. Fits almost any windshield. FREE US shipping. Fab.com has 30% Off a whole variety of humorous stickers for cats and dogs. In addition to this Drooling Dog warning, they also make the removable stickers with Caution: I Shed, Caution: Guard Cat, Caution: Affectionate Dog, and more! They are all $7 and you can browse them here!